1. A member from Team China have victoriously won a Gold Medal for their Country. 2. As she was holding up her medal, she smiled gleefully. 3. 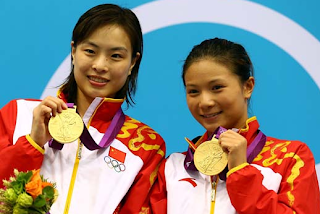 By the looks of her facial expressions she is outstandingly proud of herself, for winning a gold medal, at the 2012 London Olympics. 4. She is very dignified of herself, for winning a gold medal, which is exactly what I would do if I were her. 5. Her heart must be pounding full of joy knowing that she made her country proud.